Gosh. Isn’t there somewhere in the Bible that warns against adding stuff to it? Their “proof,” such as it is, consists of the Book of Job, which “records events that probably took place before the time of Abraham” and “contains more references to ice, snow, and freezing conditions than any other book of the Bible.” Here’s the Book of Job. Go see if you can find any continental ice sheets in it. God does a lot of bragging in that book: surely he would have mentioned freezing enormous landmasses under miles-thick sheets of ice. No? Well, isn’t it weird that a desert-dwelling dude mentioned ice and snow a lot? Erm… not really, no. In fact, ice and snow are seen often enough in Israel to make them common metaphors, and in fact, there would have been rather less cold in Israel during the Ice Age, although the summers weren’t as hot. Speaking of hot, the “Onset of the Ice Age” part begins with the authors telling us that during the Flood, “millions of underwater volcanoes formed all over the world.” Millions. They tell us the oceans would have absorbed all that heat from massive amounts of lava. And they claim that after the Flood, lots of volcanoes would’ve still been erupting, “sending lots of ash high into the atmosphere.” Voila: hot oceans caused massive evaporation, forming thick clouds, and, combined with ash, blocked out the sun. And within 500-800 years post-Flood, you’ve got an Ice Age complete with huge continental glaciers! They think it’s plausible. 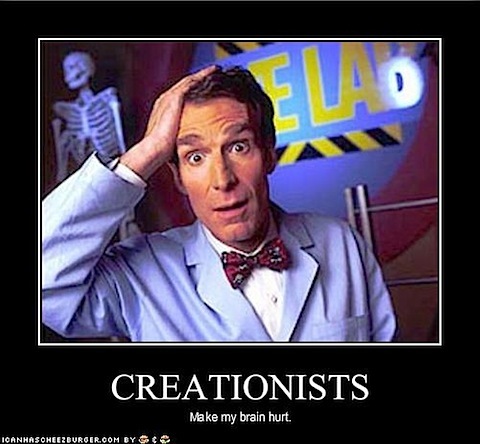 But creationists are terrible at thinking things through. There are so many problems with this scenario. First off: they’re not accounting for the tremendous amount of gasses those volcanoes and lava flows would have released into the ocean and atmosphere. As Glenn Morton says, “Noah and company would be choked to death on noxious gasses.” Sulfuric acid would have composed a quarter of the atmosphere. Nothing on the Ark aside from perhaps some very extreme bacteria would have survived that. And the oceans themselves would have been highly acidic, with a pH of 2.2. Even if fish, shellfish, and sea mammals had been on board the Ark – which many creationists claim they weren’t – they wouldn’t have survived the immediate post-Flood waters. On top of that, volcanoes release enormous amounts of carbon dioxide. In fact, counting only the CO2 released by flood basalts in the world’s large igneous provinces, 6.6% of the atmosphere would have been CO2. That’s 58,615 parts per million. We’re up to just over 400ppm right now, and we’re melting. That much greenhouse gas probably isn’t going to allow for a rapid-onset Ice Age. But even if we ignore all of that, we still have problems. Where are the gargantuan ash beds that should be interbedded with ice age deposits? Where is the enormous amount of sulfur? None of it’s where it should be if the creationist scenario is correct. And we haven’t even begun to figure out how elephant “kind” evolved so many mammoths and mastodons in such a short period of time. So. While we have an atmosphere choking on greenhouse gas, creationists like Michael Oard swear it got really cold and huge ice sheets formed. Then, once the oceans cool down, a bunch of glaciers melt and flood the Arctic with fresh water, which promptly freezes because… reasons. And then the land gets super cold because the oceans froze. And the mammoths and mastodons were too slow to GTFO like the warm-adapted animals. And there suddenly wasn’t any food, and there were big dust storms, and they all died of exposure and got buried alive and flash-frozen. I just… this scenario is so ridiculous I don’t even know what to say. And then they try to kill me by saying, “The creationary geologist’s model of an ice age following the Flood is much simpler than the secular geologist’s model.” No. No, it is not. The evidence doesn’t fit. There are too many impossible contradictions. It explains nothing well, and only works if you ignore enormous amounts of contrary evidence. You have to make evolution work at lightning speeds even though you creationists hate evolution. And there’s not a single solitary lick of proof for this in the Bible, which you’re claiming is inerrant! Not to mention, you’re relying on Michael Oard as your expert, and he’s been so very thoroughly debunked it’s not even funny anymore. Twice. So no. None of this is simple at all. Now that they’ve left us frozen with their nonsense about ice ages, they’re about to “explain” the geologic column. I can hardly wait.